This upgrade is also known as version 6.5.0 Build 5969303 or 6.5U1. I have only tested this method when upgrading from 6.5.0a Build 5224934 to Build 5969303, your experience from earlier 6.x versions may vary. I have been able to replicate that the Xeon D 10GbE X552/X557 driver VIB needs to be re-installed right after the upgrade, simple one line workaround is documented here, with details below. This is not official VMware documentation, it's merely a convenient upgrade technique that may help in lab tests, a little simpler than the official procedure VMware documents and demonstrates in KB2008939. It's up to you to adhere to the backup-first advice detailed below, full Disclaimer found at below-left, at the bottom of very TinkerTry page. See also the Drawbacks section below. If you're in production, beware, this code just came out yesterday. This article is for the lab, where you may want to give this critical patch a try. 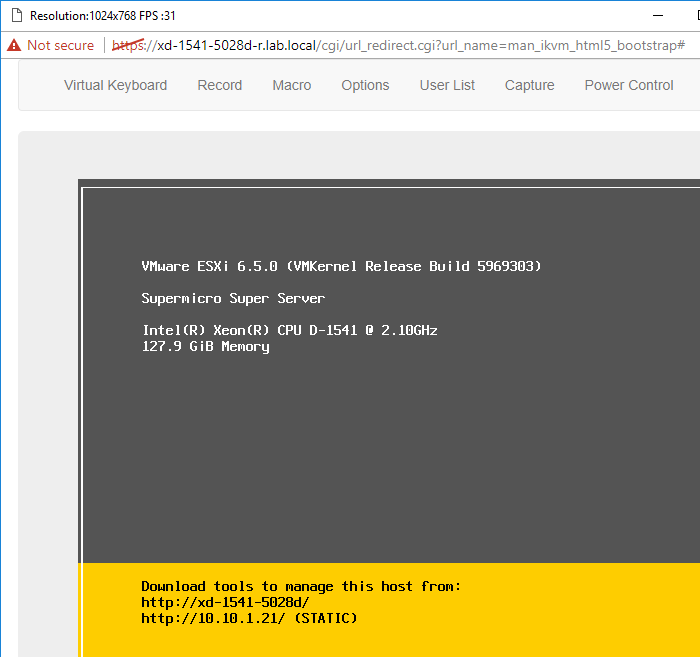 The esxcli software profile update command brings the entire contents of the ESXi host image to the same level as the corresponding upgrade method using an ISO installer. However, the ISO installer performs a pre-upgrade check for potential problems, and the esxcli upgrade method does not. The ISO installer checks the host to make sure that it has sufficient memory for the upgrade, and does not have unsupported devices connected. For more about the ISO installer and other ESXi upgrade methods, see Upgrade Options for ESXi 6.0. See also Upgrading Hosts by Using esxcli Commands and Overview of the ESXi Host Upgrade Process. 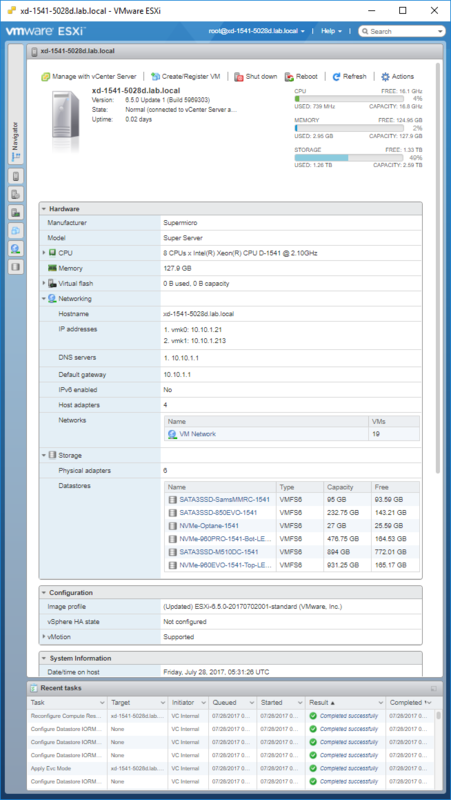 Before proceeding, you should read Overview of the ESXi Host Upgrade Process. This article below is just about the quick and easy way, effective and safe for most folks. For those more interested in "clean installs", where you login to My VMware, download the ESXi 6.5U1 ISO, shut down the ESXi on USB that you're already running, eject that USB flash drive and label it and set it aside, then boot from another USB drive like the SanDisk Ultra Fit with a fresh install of 6.5U1 imaged onto it. This clean install is much more time consuming than the easy method outlined below. Why? This is because once ESXi 6.5U1 is freshly installed, at a minimum you'll also have to use Datastore Browser to locate your VMs on your VMFS datastores, then add those files with *.vmx extensions back into your inventory, then add the host back to your cluster that should already be at 6.5U1. While this extra work may help you be sure that you don't have any drivers or changes carried over from your previous build, for many users, that's not a concern. you can now continue with this simple approach to upgrading your lab environment. Unsupported, at your own risk, see the full disclaimer at below-left. If this command fails, you may want to try changing update to install, details below, see also Douglas' comment. Wait time for the successful install depending mostly on the the speed of the ESXi's connection to the internet, and somewhat on the write speed of the storage media that ESXi is installed on. Here's how my upgrade from 6.5.0d to 6.5 U1 Build 5969303 looked, right after the 1 minute download/patch. That's it! When the reboot is complete, you'll see for yourself that you now have the latest ESXi, Build 5969303, as pictured above. Now you have more spare time to read more TinkerTry articles! If you encounter the service console networking problem, the fix is reported below. 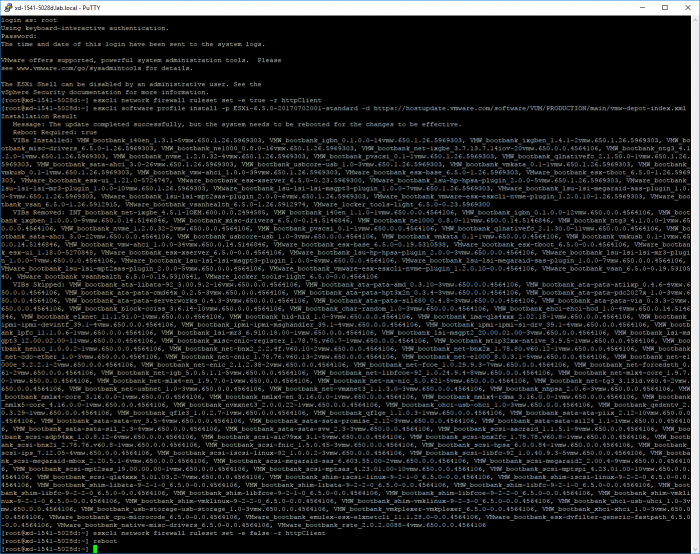 Alternatively, you could have used VMware Update Manager on a Windows system or VM, but for one-off upgrades typical in a small home lab, pasting these 3 or 4 lines of code is pretty darn easy. Looking ahead, since VUM is now built into VCSA 6.5, this adds another way to do future upgrades and patches, even in a small home lab environment. esxcli software profile install -d="zip location"
Seems like downloading update from online depot fills up your tmp storage resulting in above error. When the upgrade is complete, on the ESXi Host Client UI, under Host / Configuration, you should see the following "Image profile"